Join the annual celebration of OHSU’s innovations and innovators, industry partnerships, entrepreneurship and technology commercialization. 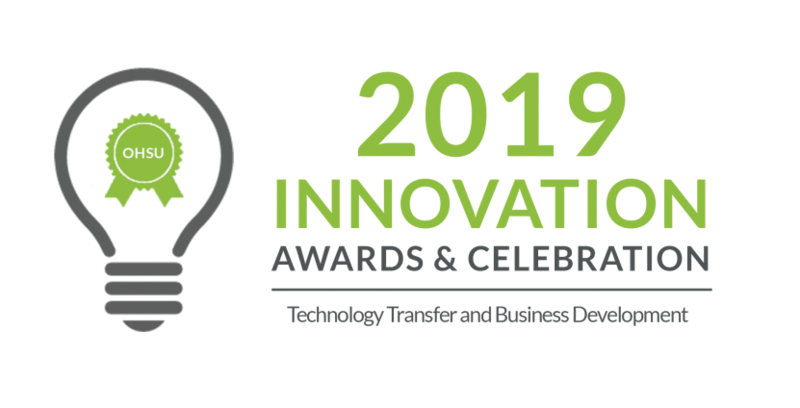 At the 2019 OHSU Innovation Awards and Celebration, hosted by Technology Transfer and Business Development, awards will be presented for New Inventor of the Year, Business Development Partnership, and Technology Transfer Achievement. All are welcome to attend this free public event. Register today to attend. President Danny Jacobs, M.D., M.P.H., F.A.C.S. will provide the opening remarks and will distribute awards and patent plaques. Matt McNair, J.D., OHSU Foundation president, will deliver the keynote address. Complimentary drinks and hors d’oeuvres will be served at the opening reception starting at 4:30 p.m. The ceremony will begin promptly at 5:30 p.m.
Come out with your colleagues to celebrate and learn more about innovation and entrepreneurship at OHSU.